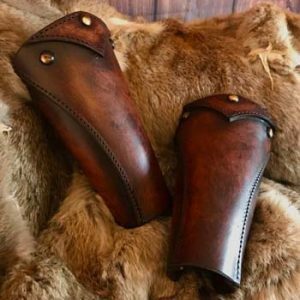 The Ravens LARP Leather Vambraces are a simple but elegant?design of armguard, offered by Black Raven Armoury , they have been professionally dyed and built for you by ourselves. Created & designed by Alex Agricola, the whole set is made of premium grade top grain Veg Tanned leather? (laminated to a minimum 6mm thickness) . This armour is 100% suitable for a variety of uses, be it Larp event, SCA, theatre stage or big screen, this kit will enable you to produce a set of fully functional ?REAL? protective armour. We’re so proud of our Ravens SCA Leather Vambraces that we’ve chosen to let them carry our name. 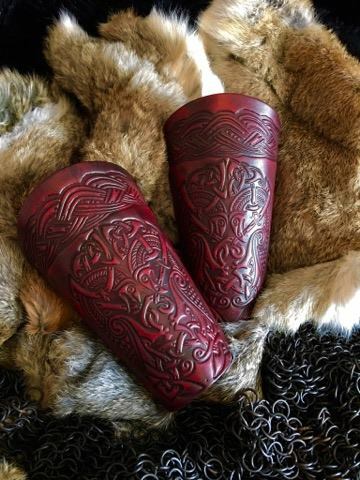 They are hand finished to an exceptional level by Alex Agricola and come complete with a stunning embossed Celtic design. 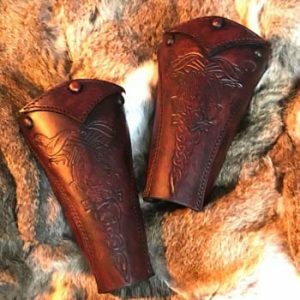 The Ravens Larp Leather Vambraces are both decorative and practical and will win you as many battles as they will hearts. They come in two sizes with the larger also bearing an extra embossing panel next to the wrist. This armour is 100% suitable for a variety of uses, Larp events, cosplay, ?SCA, renaissance faire or theatre, stage or big screen productions. ?I’m telling you I saw him at the Castle of Muskogee and again in Willington… he had ravens on his arms… Black as night they were and the whole town bowed before him…?